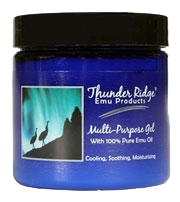 Thunder Ridge Emu Oil, which is refines to an edible grade, naturally contains Linolenic Acid (Omega 3), Linoleic Acid (Omega 6), and Oleic Acid (Omega 9) along with other Essential Fatty Acids. These Essential Fatty Acids (EFA's) have proven beneficial in aiding the healing process. Studies show that deep penetrating Emu Oil has anti-aging, moisturizing and anti-inflammatory properties. A growing number of users, including professional sports teams, chiropractors, massage and physical therapists and other medical professionals, report excellent results from Emu Oil and Emu Oil basal rubs. There is clinical evidence that it contains a high level of Lenoleic Acid (Omega 6), a substance known to ease the discomfort of muscle and joint pain. In addition to the healing effects Emu Oil has on the skin and inflamed joints, it is also rich in anti-oxidants which help to slow down the aging process and in some cases actually reverses it. It's anti-bacterial, hypo-allergenic and a natural non-comedogenic. Small Wonder it's a favorite among skin care professionals!